Home » The Real Dirt » When did you stop beating the planet? We’re reaching that time when our parent’s health is starting to decline. At some point we’ll likely have to make some decisions around assisted living. It’s not a decision I will make easily – the scandals in Ontario facilities around elder abuse are occurring a little too often. If I ever found out something was happening to either of my parents, I would have a “chat” with the manager – after he/she regained consciousness. The conversation wouldn’t be centered on how we can reduce the severity or frequency of the abuse, it would be focused on ending the abuse immediately and restoring my parent’s health. It’s black and white for me and, I assume, most of you. Unfortunately, the folks meeting in Paris aren’t taking a similar view on the state of the health of our planet. Some Western countries (including Canada) want targets that are soft – they’ll make best efforts but don’t want any accountability if they miss their targets. It’s an approach that worked really well for Kyoto and Chretien – he got the photo op for signing the accord, his Environment Minister renamed his dog and then they quietly did nothing. I have little faith in the international political process. But I do have faith in citizens. Together we can make choices to end the abuse of our planet. A single honeybee in its lifetime will produce about half a gram of honey. Each year, our hives produce between 50 and 100 kg of honey in addition to a number of pounds of wax. 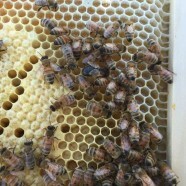 A hive is a group of individuals focused on a task that is greater than their lifetime – the bees that collect honey in the spring aren’t the same ones that will benefit from the honey stores in the winter. Humanity could learn a lot from the bee. It is going to take focus and a long term vision. Here at The Stoddart Family Farm, we believe we are on a path to restoration – not just reduction of the destruction. You are an integral part of what we do – our “co-farmers” if you will. You choosing to purchase from us is a vote for “stopping the abuse” rather than “reducing the severity.” We thank you for your votes of confidence. It is humbling – you are entrusting not only the health of this piece of land to us but also your own health and the health of your family. We believe that is a sacred trust.